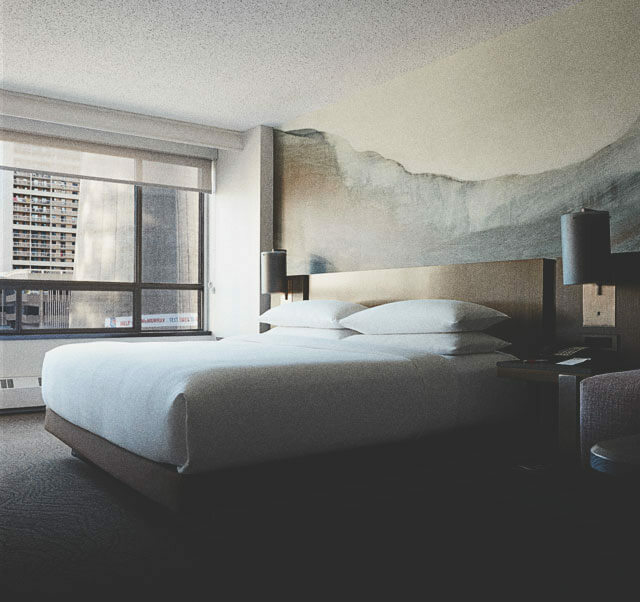 Following a multimillion-dollar renovation, the Calgary Marriott Downtown Hotel affords business and leisure travellers an effortlessly chic welcome to Alberta. The hotel offers guests unparalleled accommodations with custom duvets; 48-inch, flat-screen televisions; high-speed Internet access and dramatic views of the city and the Canadian Rockies. Other amenities, like the fitness centre with state-of-the-art equipment, Canada's first M Club Lounge, an indoor pool, concierge service, a business centre, laundry service and valet parking ensure every need is met. Similarly, the dining options speak to modern taste: An on-site Starbucks lets guests jumpstart their mornings, while ONE18EMPIRE specializes in exceptional whiskeys, local food and shareable plates. Business travellers, meanwhile, stay productive within the more than 11,000 square feet of dynamic meeting space. Located in the heart of downtown Calgary, the hotel is near the famous Calgary Tower, Calgary Zoo and Glenbow Museum, as well as vibrant restaurants, bars and shops. The Calgary Marriott Downtown Hotel affords business and leisure travellers an effortlessly chic welcome to Alberta. The hotel offers guests unparalleled accommodations with custom duvets; 48-inch, flat-screen televisions; high-speed Internet access and dramatic views of the city and the Canadian Rockies. Other amenities, like the fitness centre with state-of-the-art equipment, Canada's first M Club Lounge, an indoor pool, concierge service, a business centre, laundry service and valet parking ensure every need is met. The dining options speak to modern taste and includes an on-site Starbucks that lets guests jumpstart their mornings, while ONE18EMPIRE specializes in exceptional whiskeys, local food and shareable plates. Business travellers, meanwhile, stay productive within the more than 11,000 square feet of dynamic meeting space. 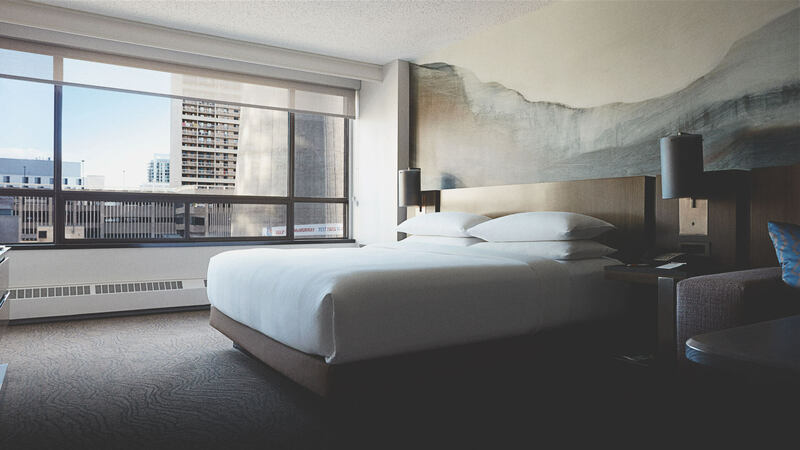 Located in the heart of downtown Calgary, the hotel is near the famous Calgary Tower, Stephen Avenue, and the Glenbow Museum, as well as vibrant restaurants, bars and shops. Surrounded by Olympic Plaza, the Calgary Tower, and Stephen Avenue, it doesn’t get any more downtown than this. The Marriott’s ONE18EMPIRE restaurant features one of Calgary’s best selections of whiskey and is a local favourite for liquor connoisseurs.